When the Chicago River is dyed green, I know it’s time to make corned beef and cabbage. This is the recipe I have been making for St. Patrick’s Day every year. 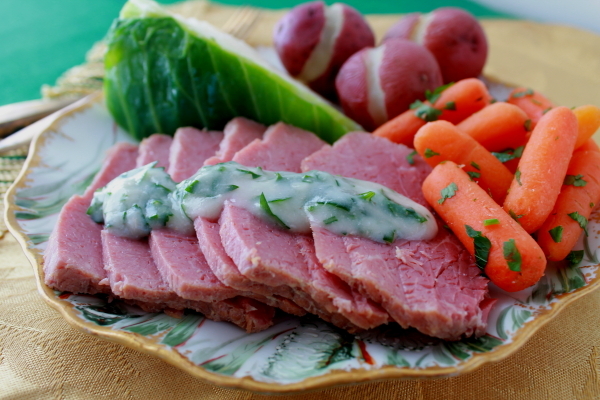 The corned beef, cabbage, and carrots are served with a delicious sauce using the corned beef broth, sour cream, a wonderful bite of horseradish, and some parsley to add the green. In a large Dutch oven or stockpot, cover beef with water. Boil for 5 minutes; discard water. Add water to cover meat, onion, carrot, and rosemary. Cover and simmer until meat is very tender when pierced, 3-1/2 to 4 hours. Lift out meat and keep warm on a platter. Bring stock to boiling. Add cabbage and cook, uncovered, until tender crisp when pierced. Lift out cabbage and arrange around meat. Reserve 1-3/4 cup stock for emerald sauce. Slice meat across the grain. Serve with hot, buttered carrots and new potatoes, and emerald sauce. Makes 6-8 servings. Emerald Sauce: In a saucepan, melt 3 Tablespoons butter over medium heat. Add 3 Tablespoons flour; stir until bubbly. Add the reserved 1-3/4 cups of corned beef stock, stirring until it boils. Mix in 2 Tablespoons prepared horseradish, 1/4 cup sour cream, and 1/2 cup chopped parsley. Stir until hot. Coming Up: The Home and Housewares Show! Perfect timing! Off to the store for my corn beef! Sounds delicious!